The lighthouse at Cape Cerbère is the ultimate French lighthouse before the Franco-Spanish border, also called "solar lighthouse." 1982 (station establishment date unknown). Active; focal plane 55 m (180 ft); white flash every 4 s. 10 m (33 ft) square cylindrical tower, painted white, enclosed on the land side by three decorative stone "wings"; the light is mounted on a short red mast atop the tower. This interesting design is by the Paris architectural firm of Lucien Guerra. The new light replaced a smaller structure much lower on the slope, having a focal plane of 19 m (62 ft). The lighthouse marks the southernmost promontory of mainland France, about 600 m (0.4 mi) north of the Spanish border. Located on the cape, about 1.5 km (1 mi) east of the Cerbère waterfront; accessible by the twisting N114 coastal highway. Site open, tower closed. ARLHS FRA-215; Admiralty E0492; NGA 6008. At the entrance of Port-Vendres, La Redoute's Lantern, built between 1673 and 1700, is among the works of Vauban. The green light (starboard / right) marks the entrance to the harbor. 1700 (inactive 1710-1770; station established in the 14th century). Active; focal plane 29 m (95 ft); green light, 3 s on, 1 s off. 18 m (59 ft) square masonry tower with lantern and gallery, painted white; lantern and gallery painted green. According to Fichou, beacon fires were displayed from a tower built here in the 14th century, but that tower was destroyed around 1610. The present tower was included in the fort built by Vauban for Louis XIV in 1684; it became known later as the Fort du Fanal, fanal being a lantern or beacon. Lights were shown from 1700 to 1710 and then continuously from 1770, with more modern equipment being installed in 1843. Located on a bluff on the west side of the harbor entrance at Port-Vendres. Site and fort open daily, tower closed. 1885. Active; focal plane 20 m (66 ft); red light occulting three times every 12 s. 17 m (56 ft) hexagonal cylindrical cast iron tower with lantern, gallery, and enclosed watch room mounted on six iron legs. This unusual lighthouse was designed by the engineering firm of Parlier and Cutzach, who were asked to design a tower of the least possible weight. Apparently they did a good job, since their work has stood for 120 years. Located at the end of the east breakwater at Port-Vendres; accessible by walking the breakwater. Site open, tower closed. ARLHS FRA-599; Admiralty E0504; NGA 6044. The lighthouse at Cape Béar is located on Mount Béar, 800 meters southeast of Port-Vendres, on the coast of Vemeille. In 1905, the first tower was abandoned because too often in the clouds. The second lighthouse was built by the sea and is equipped with a fire three white flashes every 20 seconds. The current lighthouse is a pyramidal tower (square) with exposed stone and corbelled corner linking to the top. Below are the lighthouse keepers of the housing and service buildings. The interior is neat: opaline blue walls, pink marble staircase and brass banister. The lighthouse is automated, remote and not guarded. It has a differential GPS station. ARLHS FRA-213; Admiralty E0496; NGA 6020. The Espiguette lighthouse is a square tower 27 meters high(89 ft); located in the department of Gard in the Languedoc-Roussillon. 1869. Active; three white flashes every 15 s. square masonry tower with lantern and gallery, attached to a 1-story masonry keeper's house. Upper third of the lighthouse painted black, lower 2/3 white. The Pointe de l'Espiguette is a broad, sandy barrier, the southwestern extension of the Camargue (the Rhône delta). Sediment from the Rhône is accumulating here; the lighthouse was built 150 m (165 yd) from the sea but now it is a full kilometer (0.6 mi) from the surf.The Espiguette lighthouse was built in 1869. Initially it was 150 m from shore. Today it is roughly 700 m, following the feeding of the coast by sand deposited by currents. In 1248, St. Louis sailed from Aigues-Mortes for the seventh crusade. The city of Aigues-Mortes is almost complete. Walled, it becomes an important economic to trade with Mediterranean countries. St. Louis had built the "Tour de Constance" on the remains of the tower Matafère (that Charlemagne had built) to protect the coast, the harbor and city. Located a little away from the northwest corner of the ramparts, it measures 34.11 meters high, 22.50 meters OD, and its walls, at their base, have more than 6 meters thick . The set includes a ground floor and two floors, with a platform surmounted by a lookout tower, carrying a lantern topped by an iron frame protects the lantern-light. 1246. Inactive for many centuries. 33 m (108 ft) round cylindrical masonry tower with lantern and gallery, mounted on one side of a large cylindrical donjon (keep). King Louis IX (St. Louis) built the Tour Constance and established a light on it in 1246, before he departed on the Seventh Crusade in 1248. He also had a canal dredged to make Aigues-Mortes a seaport. After the crusades, the canal silted up and the tower ceased to show a light. Located in Aigues-Mortes, a historic port town now 6 km (3.75 mi) northeast of Grau-du-Roi and the sea. Site open, tower closed. ARLHS FRA-512. Date unknown. Active; focal plane 9 m (30 ft); three green flashes every 15 s. 7 m (23 ft) post light mounted on a square 1-story equipment room. Lighthouse painted white; the light is green. Located at the end of the west jetty at Port Camargue, about 2.5 km (1.5 mi) south of Grau-du-Roi. Site open, tower closed. Admiralty E0583.2; NGA 6296. Date unknown. Active; focal plane 9 m (30 ft); four red flashes every 15 s. 6 m (20 ft) round tower rising from a triangular 1-story equipment shelter. Lighthouse painted white with red trim.This marina also has a canal connection to the Canal du Rhône à Sète. Located on the south breakwater at Carnon-Plage. Accessible by walking the pier. Site open, tower closed. ARLHS FRA-700; Admiralty E0578; NGA 6272. The tower must be located in the vicinity of camping on the route the Elysee Residence Espiguette. 1977. Active; focal plane 27 m (89 ft); four white flashes every 15 s. 24 m (79 ft) triangular concrete tower with gallery and an enclosed equipment room at the base. The light and gallery are supported by three concrete columns, with access via a stairway that spirals almost magically up the open center of the tower. Entire lighthouse is white. François La Poutré has a fine closeup, Trabas has a closeup, and Google has a street view and a satellite view. This modern design is by the architectural firm of Cardin, Diatkine et Frémolle of Montpellier. Located on the dunes behind the beach at Canet-Plage, about 800 m (1/2 mi) north of the harbor. Site open, tower closed. Admiralty E0514.5; NGA 6072. South Jetty >>> Red light, occulting three bursts in 12s, 9m, 9M. (9 meters high, visible 9 miles). North Jetty >>> Green light, flashes 3 in 12s, 5m, 5m. (5 meters high, visible 5 miles). 1886. Active; focal plane 14 m (46 ft); green light, 2 s on, 2 s off. 14 m (46 ft) round stone tower, attached to the end of the mole. There is a stone equipment room at the top of the tower, level with the top of the mole, surmounted by a round cast iron watch room and then the light supported by four ornately curved iron legs. The NGA list gives up and calls this highly unusual light tower simply a "structure." Located at the end of the jetty on the north side of the harbor entrance at Collioure, a small fishing port about 3 km (2 mi) northwest of Port-Vendres. Site open, tower closed. ARLHS FRA-243; Admiralty E0512; NGA 6056. The church of Notre Dame des Anges was built between 1684 and 1691 in a southern gothic style and is famous for its bell tower. The church is practically surrounded on three sides by the sea. The bell tower was originally a medieval lighthouse, announcing the position of the Port of Collioure by smoke in the day and fire at night. At the end of the 17th century the medieval church on the hills of Collioure was destroyed by the orders of Vauban (the French kings chief military engineer). Collioure did, however, receive the right from Vauban to build a new church on the reefs and was subsequently built next to the lighthouse. In the meantime, Vauban no longer wanted a port at Collioure, preferring the deeper waters of Port Vendres. Consequently, Collioure no longer needed its lighthouse, and it became the bell tower of the church. It was only 100 years later, however, that the parish decided to cover the tower with a domed roof, inspired by the Tuscany architecture. Later, when the harbour was no longer used as a port, the lighthouse was incorporated as the church belltower. The domed cupola (in an Italian style) was added early in the 19th century. The interior of the church has a huge carved wooden altarpiece covered in gold leaf. History: The port was created by Colbert, and is built in 1666 to help open the Canal du Midi. The Chevalier de Clerville began construction in 1669 of the great mole. . - 1684: Ignition on a tower built on a project presented by engineers and Mortuaries Delafeuille 1673. The first tower will be razed and rebuilt in 1690 according to a draft presented Nickel in 1690, from 7 yards (14 m) high and equipped with oil lamps in a small metal lantern. - 1720: construction of a new square tower 18 m high. - 1771: Installation of street lights Tourtille-Sangrain: 24 reflectors in 3 rows in a lantern 10 feet high (3.24 m). - A tower of 25 m is recorded in 1831. fixed light. - the tower is moved further down the pier and equipped with a fixed light-puissant. more February 15, 1861: ignition on a cylindrical turret masonry stone of 27 m high. The tower was destroyed August 19, 1944. The new tower will be rebuilt from the foundations remained intact, starting from the third seat. The circular tower is 6.50 m in diameter at its base and four M75 sommet.Feu its interim 1945 to 1949: ignition of a cylindrical tower of stone masonry of size 30 m high. stone from the quarry of Cassis and the sand of the Herault river. Year built: 1946 Active; focal plane 34 m (112 ft); four flashes every 12 s, white or red depending on direction. 31 m (101 ft) round masonry tower with lantern and gallery. Tower painted white; lantern painted red. Site open, tower closed. ARLHS FRA-486; Admiralty E0546; NGA 6180. Latitude :43°24'0" N. Longitude :3°42'18" E.
Date unknown. Active; focal plane 20 m (66 ft); red flash every 4 s. 15 m (49 ft) concrete tripod tower. Entire lighthouse is white. . NGA formerly listed the tower height as only 7 m (23 ft), probably referring to an earlier light. The Sète Epi Dellon breakwater has a long eastward extension, and this light is located at the extreme east end of the breakwater. Accessible only by boat. Site and tower closed. Admiralty E0547.5; NGA 6200. 1869. Active; focal plane 15 m (49 ft); red light occulting twice every 6 s. 8 m (26 ft) round cast iron tourelle with lantern and gallery. Tower painted white; lantern and gallery painted red. When it was built, this lighthouse marked the north end of the outer breakwater. By the 1890s, the breakwater had been extended eastward, so the lighthouse now stands in the elbow where this newer section joins the original. Accessible only by boat (the outer breakwater does not connect to shore). Site and tower closed. Admiralty E0550; NGA 6192. The lighthouse of Mont Saint-Clair of Sète was built in 1903. Wearing a beautiful lantern, the octagonal tower is 23 m high and rises to 97 m above the sea Its white light has a range of 29 miles, about 53 km. The lighthouse at the Mont St. Clair is not open and is automated.1903. white flash every 5 s. 23 m (75 ft) octagonal masonry tower with lantern and gallery. Tower painted white; lantern painted dark green. A magnificent turn of the 20th century tower. Keeper's houses and other station buildings also survive. Located off the Chemin du Phare, on the slope of Mont Saint Clair, to the west of the harbor entrance and just below the sailors' cemetery. Site open, tower closed. ARLHS FRA-362; Admiralty E0544; NGA 6164. The Onglous's lighthouse,This light is located on the town of Marseillan on the edge of the Thau lagoon announcing the entrance of the Canal du Midi.Date unknown. Active; focal plane 10 m (33 ft); white or red light depending on direction, oThe Onglous's lighthouse,cculting twice every 6 s. 11 m (36 ft) round cylindrical masonry tower with lantern and gallery. Tower painted white, lantern and gallery rail red. Built in the late 1600s, the Canal du Midi provided (and still provides) a water connection between the Mediterranean and the Garonne, which flows into the Atlantic below Bordeaux. Located on the east jetty at the canal entrance, about 1.5 km (1 mi) south of Marseillan. Site open, tower closed. ARLHS FRA-376; Admiralty E0568. Square masonry tower with lantern and gallery, rising from a large fortification. The building is now a French Navy signal station.The 1750 Tour des Anglais, but it is not clear that this tower was used as a lighthouse. The lighthouse was built in connection with improvement of the Canal du Midi, which made Agde a major port. In 1903, with Agde in decline, the light was moved to Mont St.-Clair in Sète. Located at an elevation of 113 m (370 ft) on the summit of Mont Saint-Loup, an extinct volcano rising on the southeast side of the town of Agde, about 2.5 km (1.5 mi) from the coast; the mountain is protected as a nature reserve. Site open, tower status unknown,It is currently privately owned. Date unknown (station established 1805). Active; focal plane 14 m (46 ft); green light occulting once every 4 s. 11 m (36 ft) round masonry tower, painted white. Fog horn (blast every 10 s). This lighthouse replaced a cast iron tourelle installed in 1867. Located at the end of the east jetty at the mouth of the Rivière de l'Hérault in Le Grau d'Agde. Accessible by walking the jetty. Site open, tower closed. ARLHS FRA-068; Admiralty E0535; NGA 6124. Date unknown (station established 1868). Active; focal plane 14 m (46 ft); red light occulting twice every 6 s. 11 m (36 ft) round masonry tower, painted white. The original lighthouse was a cast iron tourelle. Located at the end of the west jetty at the mouth of the Rivière de l'Hérault opposite Le Grau d'Agde. The jetty is accessible by a road on the west side of the river, and the light is probably accessible by walking the jetty. Site open, tower closed. ARLHS FRA-140; Admiralty E0534; NGA 6128. The lighthouse of Port-la-Nouvelle was destroyed during World War II. After his retirement by the Armistice Commission in 1942, its lens is removed in November and its turret blown up in 1944. Then rebuilt as a "fire thrown" at Port-la-Nouvelle, is a cylindrical tower of 18 m with a white flashing light.Active; focal plane 23 m (75 ft); quick-flashing white light. 18 m (59 ft) round cylindrical concrete tower with gallery and a small lantern, painted with red and white horizontal bands. The rear light of the range is a skeletal mast on a building 3.5 km (2 mi) west northwest. Located on the south jetty at the harbor entrance in Port-la-Nouvelle. Accessible by walking the jetty. Site open, tower closed. ARLHS FRA-427; Admiralty E0522; NGA 6100. The fire of the north pier was lit January 15, 1882, it was a fixed light green on the amounts of iron and tin shack. He was replaced on 20 May 1903 by a fixed light green on a column of cast iron painted white and then by a fire on a green isophase white conical tower 12 meters high. Date unknown (station established 1882). Active; green light, 2 s on, 2 s off. 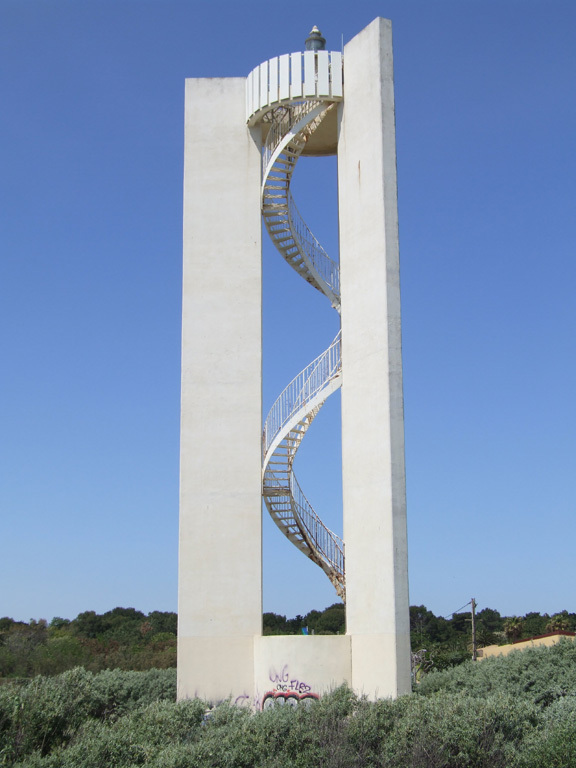 12 m (39 ft) round cylindrical concrete tower, painted white with a green top. T Located on the north jetty at the harbor entrance in Port-la-Nouvelle. Site status unknown. ARLHS FRA-426; Admiralty E0524; NGA 6104. Latitude : 43°0'48" N. Longitude : 3°4'12" E.
was light in 1951. This is a pyramidal tower of 19.40 meters in height, square brick quoins and smooth rigid with numerous buildings, the consoles are connected by arches supporting a metal railing. The lighthouse of Cap Leucate replacing the lighthouse in Port-la-Nouvelle, destroyed during the war, this building was built between 1949 and 1951. It is a total height of 19.36 meters and is located 68.32 meters above the sea level white light on 2 flashes every 10 seconds.1951. 19 m (62 ft) square pyramidal masonry tower with lantern and gallery, attached to a 1-story keeper's house. Lighthouse painted white with unpainted granite trim; lantern painted red. Located on the Chemin du Phare on the north side of Leucate-Plage. Site open, tower closed. ARLHS FRA-230; Admiralty E0518; NGA 6088.